bedtime stories | Flickr - Photo Sharing! siia, Blissful Begonia, Veronica TM, and 26 other people added this photo to their favorites. i love this sweetie & her cat. 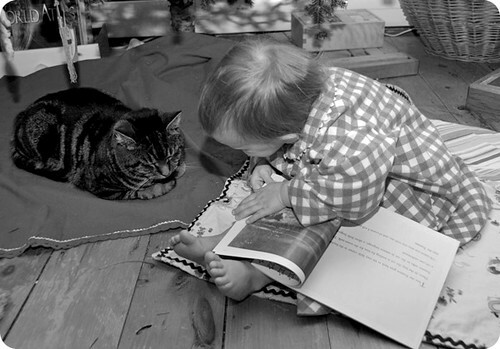 I love the communication between the sweet babe and the cat. elle needs a robe. it's official. So lovely, I nearly cried when I read the post. I loved that book when I was a child. awww. what a precious photo! What a precious moment you cought with your camera! oh my goodness. that is just sweetness, right there. our cat is called banjo as well (and i live in adelaide, south australia). my banjo is skinnier than yours, but has the same markings, and what looks like the same disposition. After looking at your collection of Banjo and Adelaide photos I can't help but adore the documentation of their relationship, which you've captured so well. This one is my favorite.